As soon as we got engaged in March & set the date for December, I knew I was going to do a lot of stuff myself for the wedding. I really do enjoy crafting, and also I can be a little bit of a control freak. I won’t guarantee that I saved a ton of money, but I did get exactly what I wanted, designed by me, made to my specifications. These projects were time consuming! And time is money, friends. 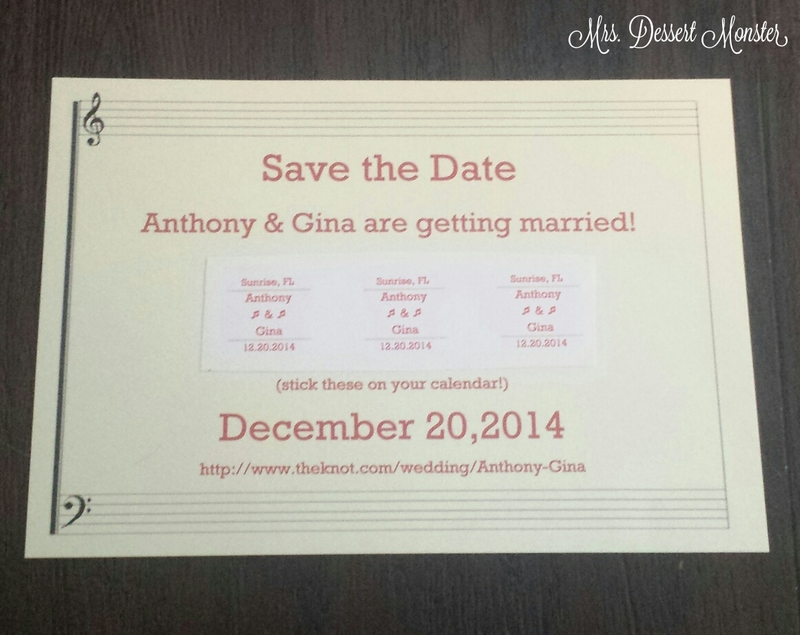 From the very beginning of our engagement we decided on a Christmas-y Music themed wedding. We met in high school marching band & both remain pretty band nerd-ish (we play hand bells at our church). I saw the idea for save the date calendar stickers before online, & I think mine came out pretty good! I probably did save quite a bit of money on my invitations. The secret is that I cut almost all my own paper. I originally bought an invitation kit from Michael’s that included the RSVP cards. 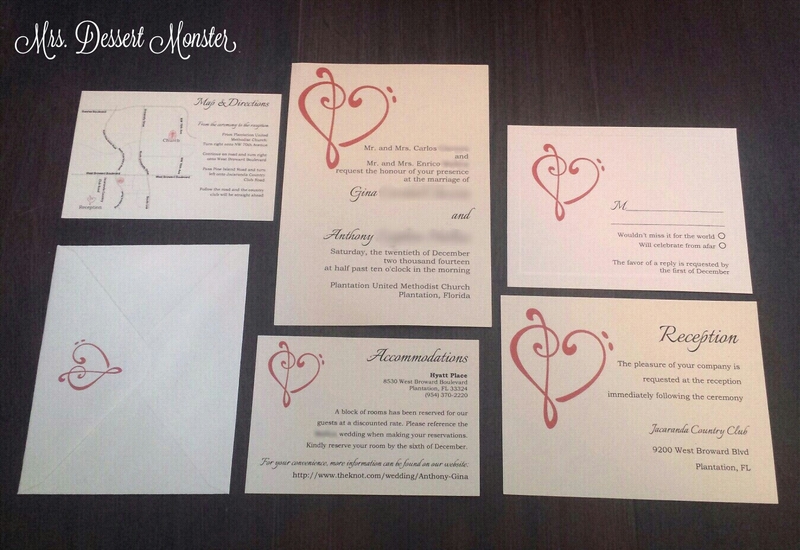 I didn’t like the invitation but I did like the RSVP cards so I used those. Then I bought 8.5 x 11 cream card stock, as well as sheet music & red card stock 12 x 12 in bulk (watching for sales & 50% off coupons at Michael’s) & spent hours with a paper cutter watching Gilmore Girls & cutting paper. I only cut myself once during the entire process! I took the advise of a lot of DIY invitation blogs/forums I read & chose my envelopes first, then decided what size I wanted the invitation to be. I read several horror stories where brides made these beautiful invitations that were not a ‘standard’ size & then their enveloped cost a fortune or didn’t fit properly. In my invitation suite I included invitation (7×5), reception card (4.5×5.75), RSVP card & envelope (5.5×4.25), map/directions card(3.5×5), & accommodations/website card(3.5×5). Then all of these inserts were wrapped together with a belly band. I designed & printed everything myself, including the envelopes. 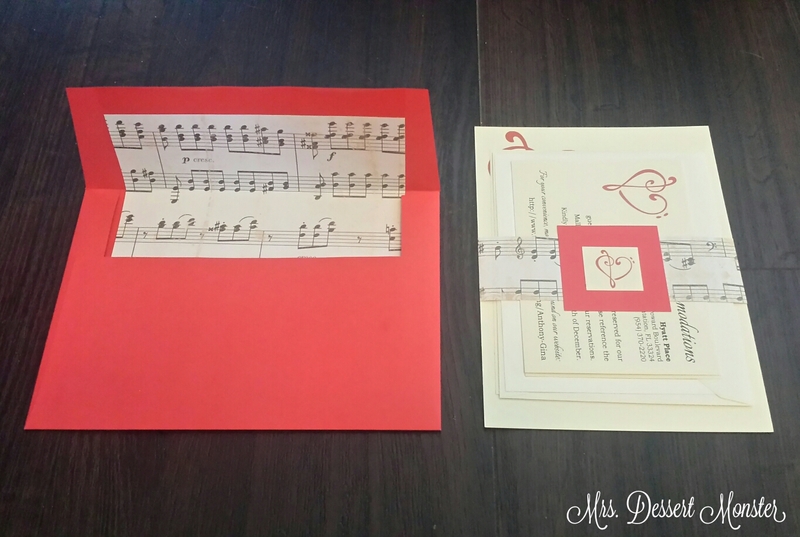 There are tutorials online for doing mail merges & how to print on envelopes. I lined the envelopes with the music paper. This worked out well for me since I bought square flap envelopes – I just had to cut the sheet music up into squares. Had they been the pointed/European style envelopes I don’t think I would have put myself through the trouble. I had help assembling the invitations. After I cut everything, my mom, mother in law, sister in law, and BFOTB (best friend of the bride – a la Sookie from Gilmore Girls) came over for an assembly party. The last thing I printed for the wedding were the programs. 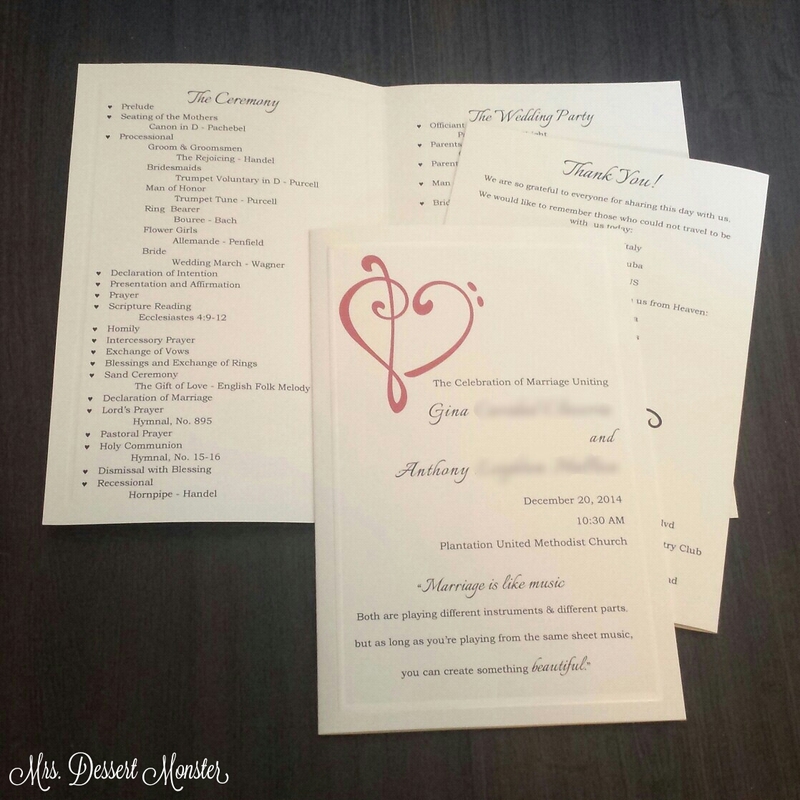 I bought a bi-fold program kit from Michael’s & designed them similarly to how I did the invitations. I was very pleased with how they turned out. This was A LOT of work, but it’s a once in a lifetime experience. It made the wedding planning experience more ‘mine’, & I thoroughly enjoyed it! Good to know you did your own and loved them! Currently in the process of designing and doing my own save the dates — and eventually invitations and programs. I might be crazy, so it’s nice to know there are others out there too! Hahaha, yea it was a big project! I gave myself a bunch of deadlines (that I never met), but in the end I sent out my invitations right on schedule. START EARLY! Ohhh this is really cool Gina. Thank you! It’s not terribly difficult, just requires patience (which I didn’t always have)! Mandie from YellowDogPinkPig – join me for Wedding Wednesdays.